The biogas is a fuel generated in natural mediums or in specific devices, by the reactions of the organic material biodegradation, by the action of the microorganisms and other factors. This gas is well known as “swamp’s gas”, that’s because in these, the biodegradation of vegetable waste similar to the described one, occurs. The production of Biogas by anaerobic decomposition is a useful way to treat the biodegradable waste, because it produce a fuel of great value and it also generate an effluent which can be apply as a conditioner to the soil or generic fertilizer. 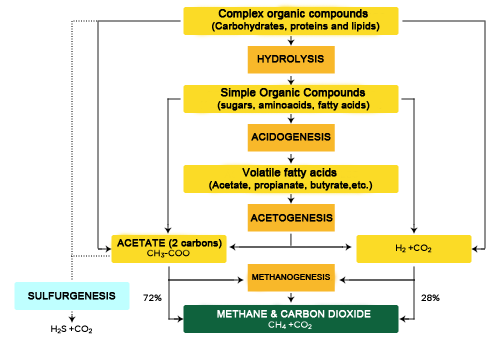 The anaerobic digestion is a complex and degrading biological process, in which part of the organic materials of a Substrate (animal and vegetables waste) are transformed into biogas, (mix o carbon dioxide and methane with traces of other elements) by a consortium of bacteria sensible or completely inhibited by the oxygen or its precursor (example H2O). Using the anaerobic digestion process, it’s possible to transform great amount of waste, (vegetables, manure, Effluents from the food industry and Fermenter, of the paper industry, FORSU – Solid urban organic waste phase- and other chemicals industries), a in useful by-products. In the anaerobic digestion more than the 90% of the available energy by direct oxidation is transformed in methane, consuming only a 10% of the growing bacteria energy compared to the 50% consumed in an aerobic system. This gas can be used to produce electric energy by turbines or plants that generate gas, in ovens, heaters, dryers, boiler or other systems of Gas combustion, properly adapted for such effect. Biomass currently accounts for two-thirds of renewable energy in Europe and bioenergy is expected to play a key role in achieving the ambitious targets approved by the renewable energy directive (COP 21), to supply, at least, 20% of the generated electricity for the 2020 year, when currently the quota is much lower. 1) Allow the correct identification and characterization of the biogás potential and organic fertilizers. 2) Detect the development of the best solutions and applications for the biogas exploitation and the organic fertilizers or biofertilizers. 3) Promote the use of the biogas systems and the use of the biofertilizers. In some cases it may be required mixes (codigestion) to make the viable processes. Of the previous types of biogás, the most noble and with less amount of impurities is the one obtained by the agroindustrial waste. However, in the cases in which manure and Slurry Substrates are used it may appear significant amount of hydrogen sulfide in the biogas; wich will be precise to debug before its Energy use. This biogas is generated by the anaerobic digestion of the primary sludge of the treatment plants of waste waters. Sludges of depurator stations of urban waste waters. This biogas it’s generated by an organic fraction coming of the RSU. Biodiesel industries (vegetables by-products), bioetanol industries (vegetables by-products), Biorefineries, Glycerin. Other waste of the food chain: gastronomy waste and oils. Of the food industry of animal origin: gby-products of animal origin not destined to the human consumption.